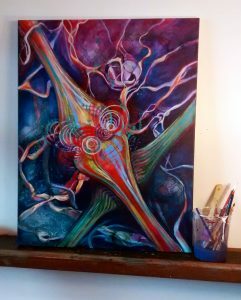 Rather than succumb to the temptation of taking off in a completely new direction, I am challenging myself to continue on in my personal commitment to the Neuron Series.This requires artistic discipline I have not exercised in such a way before. I must admit that I am thoroughly enjoying this deeper engagement and devotion to subject matter. My attention span is reaching a length I didn’t know possible, supporting my speculation that working in a such way must be causing my own neurons to fire and connect in new ways. What a win, artistically and most personally! In this latest work, I am stretching my research and engagement to include the aspect of synapse, defined as the point at which a nervous impulse passes from one neuron to another through electrical or chemical signal. It certainly is intriguing to study and represent at such a micro level.